What is the number one thing you can add to your selling process that is bound to make a huge difference? Enthusiasm sells. This super strength, high powered excitement is ultra powerful, addictive, and contagious. Enthusiasm is; energy, excitement, strength, power, confidence, motivation, positive attitude, persuasion, and power all rolled into one. Enthusiasm, used correctly, is not “showy” or “flashy.” It cannot be faked. It is the ability to exude all those qualities above into your product or service. It is the ability to show that you really genuinely care for your product or service and believe in its benefits and translate that to the customer. 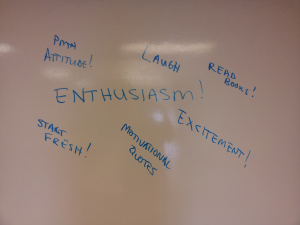 How does one get or maintain enthusiasm? Not everything is going to go your way each moment of each day, and you are going to feel un-enthusiastic at times. There are some things you can do to keep enthusiasm in your corner, or find it when you have lost it. POSITIVE MENTAL ATTITUDE: There is nothing worse than a negative attitude. It sours the air like day like a glass of milk left out on a 100 degree day. Negative attitudes translate to your customers. They can sense when you are off. Your negative thoughts translate to negative vibes and people around you will pick up on it. So if you are bummed about your sales performance, your finances, your favorite team losing, the weather, the argument you got into with your significant other, boss, or co-worker, or whatever it will telegraph through you to your customers. So break the negative thoughts. Shake it off. “Click it to Zero.” Do whatever you have to do to shake those negative thoughts. LAUGH: Get laughing. Nothing breaks the negativity more than laughter. Tell a joke. Read a joke. Think about a funny time in your life. Watch a funny video clip. Laugh at yourself. There are many ways to get the laughter going. Laughing changes your posture, gets you in a better frame of mind, and sends endorphins rushing through your body. So, get laughing! READ BOOKS: Many times it is difficult to get motivated. It is hard to break out of a funk. I have found that if I read something it is a momentary escape from my life. It is a break from all the thoughts going on in my head. It doesn’t matter what I read, it allows me a moment to be someone else. Many people read motivational books. Stories of personal journey, or how to books help. You can learn a lot from others successes. You can learn a lot from other trials, tribulations and how they overcame them. There are many ways you can gain enthusiasm from reading. There are millions of books out there, so find what works for you. START EACH DAY FRESH: My old boss used to say, “Before you go to work, take your brain out and put it in the fridge, come to work, do what you need to do, and when you get home you put your brain back in.” What he meant by that was, leave your problems, issues, insecurities, etc. at home. Be fresh each day and leave your problems behind so you can be at your best. READ MOTIVATIONAL QUOTES: If you need inspiration, there are tons of sites out there with positive motivational quotes. Find a new quote each day that inspires you. Read it several times a day to keep you in the flow of things and in the right frame of mind. HAVE EXCITEMENT: Find something to be excited about in your day. If you are down all the time you enthusiasm won’t find you. Find one thing in your day to be excited about and hold onto that thought all day. Don’t let the negative forces in the world get to you. SO, IF YOU ARE NOT ENTHUSED—GET ENTHUSED!